To get there, on a recent December day, LUHS Buildings and Grounds Supervisor David Arnold unlocks an internal door, leads the way up a flight of stairs, past air handling equipment that dwarfs us, onto the first roof, up a iron ladder, another roof top, still another iron ladder and still another rooftop, and then up the final ladder, where we stop to collect our thoughts (and breath). There, on that uppermost flat roof of the Lakeland Union High School field house, is a field of energy-collecting solar panels that rests like spring daffodils under a two-inch blanket of freshly fallen snow. “That’ll melt soon,” says Arnold, glancing at the mid-morning sun beating down on us. Visible only to the occasional visitor, birds and aerial drones operated by the school’s media production program, the 1,056 photovoltaic (PV) panels installed by Madison-based SunPeak will soon convert sunlight into electricity for the electrical feed on the west side of the building. There will be summer months when the system will produce close to half of the electricity the meter needs, says District Administrator/Principal Jim Bouché. 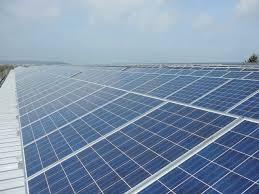 Winter, with its shorter hours and more cloud cover, will result in less solar energy production by the panels. Bouché was an early advocate of placing additional solar panels on the roof as part of what’s known as Wisconsin Act 32-financed energy savings measures undertaken at the 9th-12th grade school. Act 32 legislation allows school districts to levy additional property taxes to pay for such projects without going to referendum to exceed revenue limits. The solar panel project is just one of 20 some energy saving projects either being done directly, or overseen, by Schneider Electric Buildings Americas. Inc.
Once finished, those projects will cost nearly $15 million. Bouché said it’s been a team effort – from Director of Business Services Greg Kopp to Arnold and his custodial staff and various contractors -- to get the project completed with few, if any, problems along the way. On a good summer day – sunlight with no cloud cover– the solar panels collectively can output 280 kilowatts. It comes off the solar grid as direct current (DC) and into power inverters, which changes it to alternating current (AC). Arnold says they routed the solar electricity into the electrical system for the 1998 addition and the renovated areas on the west side of the building. Arnold explains the school’s electrical demand doesn’t drop significantly in summer, because the building still gets used by summer school classes, office personnel, and for weekend events such as the antique show and gem and mineral show. As such, the building has to be cooled by the large rooftop chiller that is powered by electricity. Bouché points out that not only will the district benefit from lower utility bills, Schneider Electric and SunPeak will provide classroom materials and teacher training so students can gain a better understanding of solar generated energy and the industry. The educational focus will be channeled through STEAM – an acronym for an educational approach to learning that uses Science, Technology, Engineering, the Arts, and Mathematics to guide student achievement. Bouché rattles off a few examples of learning tied to the PV system: using math equations to determine energy use, calculating reduction of the school’s carbon footprint, how to convert DC to AC, etc. SunPeak began installing the PV solar panels early this fall and was finished just before Thanksgiving Day. Since then, electricians and others have been wiring the system and installing components to meet the utility company’s requirements. Pairs of the 6-foot by 3-foot solar panels are arranged like playing cards tipped against each other, facing east and west. They rest on a pad laid down after the new roof membrane was installed. The panels are not attached directly to the roof, but rather are weighted down by large, solid concrete blocks. Bouche says the panels can withstand winds of up to 140 miles per hour. The district can install more solar panels in the future, as the field house roof comprises a little more than 10 percent of the square footage of all the roof surfaces. For now, Lakeland can claim to have the largest rooftop-mounted solar PV system of any school in Wisconsin, says Bouché. The estimated cost of the solar PV system was $631,284, according to the Act 32 project list that Schneider Electric presented to the school board last summer. Schneider Electric guarantees that the first year’s savings in electrical costs will be at least $15,394, but estimates it could be as much as $18,110. Continuing, Schneider Electric guarantees electrical energy cost savings of $291,382 over 15 years (it projects a possible savings of $382,814 over that same period) and maps out additional savings of $553,069 past that period. At the end of 30 years, which is the life expectancy of the solar panels, the district should net $264,599 in electrical energy savings, it says. The LUHS campus consumes about 1.9 million kilowatt-hour (kWh) annually, according to a 2015 report by SunPeak. The district now pays WPS between 4 and 6 cents per kWh depending on the time of day. That rate won’t drop, but the district won’t be buying nearly as much electricity from WPS. Both men said it’s unlikely that the district would feed surplus electrical power from the solar system back into the utility company’s grid because WPS isn’t willing to pay much. “We are going to go a year and see what the performance is,” adds Arnold about further decisions. Unlike energy from fossil fuels such as oil, coal and gas, the generation of electricity by so-called PV panels does not release planet-harming carbon dioxide. Some would argue, however, that materials and labor needed to produce those panels leave their own carbon footprint on the planet. SunPeak is set to energize the system on Dec. 15. There won’t be an open house or showing of the panels simply because it’s too hazardous for people to access the rooftop. However, the public can visit the LUHS website luhs.k12.wi.us where a video produced by the school’s media production shows the new solar panel system, as well as the SolarWise solar panels (2.45-kW system) installed back in 2012 as a demonstration project by Wisconsin Public Service. The Lakeland Union High School Board of Education has approved an initial resolution authorizing $14.66 million in general obligation bonds to finance 20 major infrastructure projects at the high school. A new education foundation in the Lakeland area is poised to begin fundraising after the Lakeland Union High School Board of Education Tuesday approved a memorandum of understanding (MOU) between the district and the foundation. The legal document prepared by Buelow, Vetter, Buikema, Olson & Vliet, LLC., outlines the relationship between the district and the Lakeland Union High School District Foundation, Inc.